It was, admittedly, not the greatest weather for an away day. We huddled together on the platform at a rainy Plymouth station, clothes officially making their transition from ‘slightly damp’ to ‘quite wet’, waiting for our already delayed train to Bristol. A lesser theatre company might have given in at a time like this, far too tempted by the warmth of the coffee shop back in the station and the calling of our recently departed beds. We, being aptly named after the mythical and aquatic ‘Narwhal’ (See our last blog for clarification) seemed unperturbed by the rain, and being such a determined bunch, stuck it out until we finally slumped in our warm carriage and settled in for the journey. After picking up the last remaining Narwhales a few stops down the line, our expedition to meet the Made In Bristol Company was well and truly underway. Our minds then turned from the discomfort of the rain to what the day ahead would hold: Who were the ‘Made In Bristol Company’, and how would it feel to be in a different theatre city away from the comfort of the lab, and what experiences would we be able to offer them? The last two weeks had been a busy and productive time with 2 outside practitioners sharing their work with us. Firstly, the enthusiastic Dan Canham of Still House brought to us his playful and highly physical approach to exploring and creating work. The week after we had a music/singing workshop with David Ridley from Bucket Club, who wowed us with his outlandish musical inventions. We all came away from that workshop with a real sense of how we might integrate music into the work we will be starting to make, and the way in which music can be a form of storytelling as much as words or movement. Alongside these external workshops, members of the company finished the workshops we had started for each other a few weeks back, including adapting stories for the stage, the qualities and characters we might find in found objects, using a mix of the physical body and limited speech to explore abstract ideas, and a workshop using flow of consciousness writing to create short pieces It had been a good few weeks, and we felt ready to try something we hadn’t done before. It felt like we were really in the thick of it all. Finally, and only a little late, we arrived in Bristol. With the weather a bit brighter, we turned up at the stage door of the seemingly tucked away Bristol Old Vic in an eager and positive mood. This, however, was another group’s space, and we were interested to see how it’d feel to be in someone else’s den. We sat in the obligatory drama circle, and introduced ourselves. 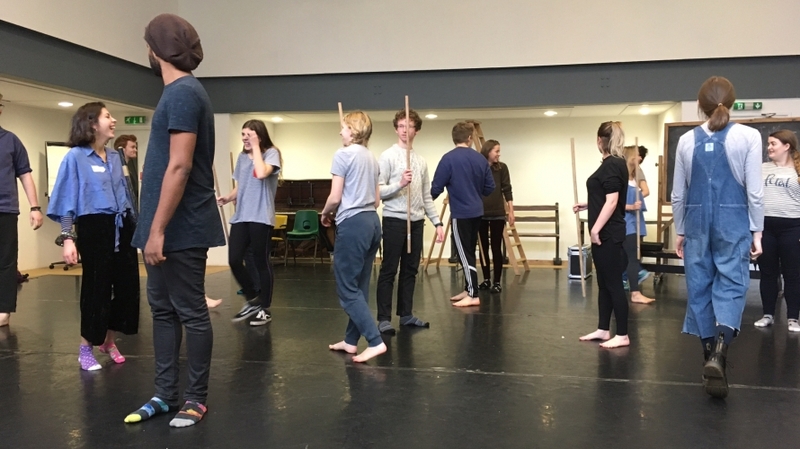 For the morning session, we would be participating in a workshop led by Lisa Gregan, the Young Company director at the Old Vic. We began with some warm up games, and then participated in a workshop centred on creating work, using a Frantic Assembly exercise, in pairs. When the time came to show back what we had started to create, there was a real sense of growing camaraderie between the two companies, and the work we created was surprising and in turns hilarious, loving, and incredibly interesting to watch. Eventually, the day came to its end. I think all of us were surprised about just how productive the sessions were. 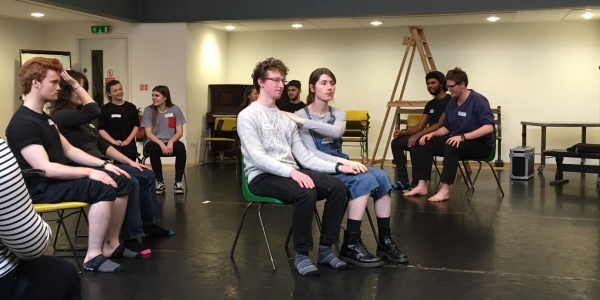 It was refreshing to step outside the bubble of the Lab for a day, and meet a group of likeminded emerging theatre-makers, swap notes, and just play about for the hell of it! We all seemed to come away with a refreshed sense of why we make theatre, and a desire to get back to the Lab and immerse ourselves into the work. After a few goodbyes, and promises to stay in touch, the Narwhal Ensemble and the Made in Bristol Company parted ways, and we clambered wearily onto our train home. It seemed that the early start and subsequent rainy wait was definitely worth it.